Is the concept of burnout a scientific diagnosis, an excuse or a description of stressful conditions that have gone on too long? We would suggest the latter, because burnout is simply a description of the condition of people who have become discouraged, depressed or have developed a sense of hopelessness about being able to alleviate stress. Another way to think of burnout is as the logical conclusion of stress over a long period of time. Preoccupation with work and putting in long hours to the exclusion of outside activities. Blames someone else when things go wrong. Who Is Most Likely To Experience Burnout? Those who feel “caught” (feelings that are related to financial security, location changes, fear and/or the threat of unemployment). Negative feelings can be expressed. Supervisors are provided training and support. An opportunity is provided to understand employees as people. It is possible to achieve realistic goals. The reward system includes recognition for achievement. Possibilities for staff realignment make it possible for job change, either temporarily or by way of promotion. A career counseling program allows employees to talk about their own career goals. A continuing education plan is made a part of each employee’s career objective. This allows for new knowledge, training and redirection in one’s career. While too much stress can have a negative personal impact, an appropriate amount of stress is an important part of being an effective person and employee. Without some stress, many of us would not bother to even get out of bed each morning. A certain amount of stress helps most of us stay on our toes and motivates us to achieve a standard of excellence that is a powerful step in promoting self-esteem. Finding a level of stress that is helpful in producing good results yet does not become debilitating is the goal. 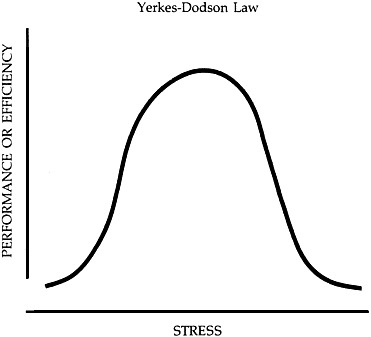 The Yerkes-Dodson Law diagram below shows a bell curve that recognizes the stress level in one direction and efficiency or performance in the other. Each of us needs to find the level of stress that is most effective for becoming quality persons and quality employees. Optimum efficiency and optimum stress will vary for each of us, so there is no “right” standard. Finding our ideal is an important dimension so that we will be able to use the appropriate amount of stress in our lives. Reprinted by permission of Harvard Business Review. An exhibit from “How Much Stress is Too Much?” by Herbert Benson and Robert Allen (September/October, 1980). Copyright © 1980 by the President and Fellows of Harvard College; all rights reserved.